If you're going to start off preparing you should probably have at least some basic staples on hand and stored in such a way that they'll keep for a long time. Currently, we are storing three kinds of Flour, sugar, salt, brown sugar, bisquick, several different kinds of pasta, rice, corn starch and corn meal. We've just started getting in other dry goods like powdered milk and eggs. Anything that we're not getting in #10 cans is currently being stored in either 2 quart glass jars vacuum sealed with the Food saver, or in 5 or 7 gallon buckets sealed with the Gamma Seal Lids. Each container that's sealed has an O2 absorber and a desiccant pack inside. Storing pasta for long term storage needs just a little bit of prep work before you put it away. We will stock up on pasta when we see it on sale, as soon as we get it home, we'll take it out of the boxes and put it in a big plastic bag, squeeze out all the air we can, seal it and put it in the freezer for 3 days. That kills the little larvae of the worms that are just inside the boxes and that will eat your pasta while it's on the shelf. After three days, we take it out and put it in the 5 gallon buckets with the O2 absorbers and desiccant. I store elbow, rotini and penne in the big buckets. 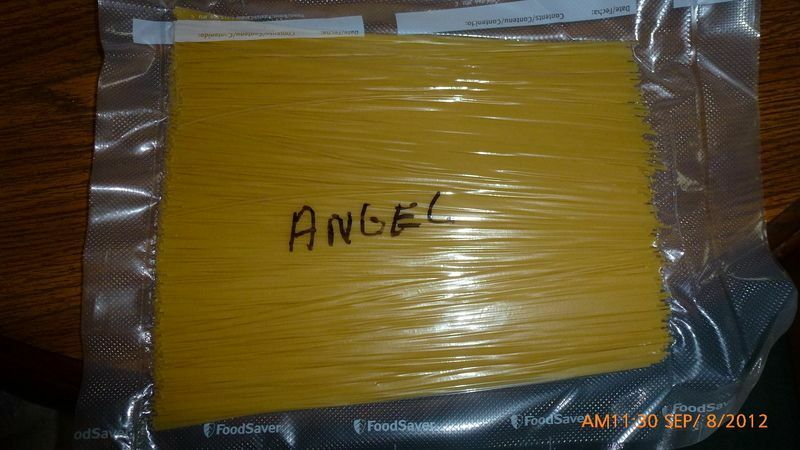 Things like Angel Hair, Spaghetti and Fettuccine are store in 11" vacuum bags like pictured below. One entire box fits in the bags like that, they can then be stored in plastic containers on the shelf or even in a filing cabinet drawer. In case you're not aware what a Gamma Seal lid is. It's a ring with a screw lid and rubber gasket. They can be put on the 3, 5 and 7 Gallon HDPE buckets, and come in a variety of colors. The best deal I've seen for them online though is through Costco. As that deal comes with the O2 absorbers as well. Dutch........ What about long term storage of off the shelf can goods ? Like soups, chili, beef stew and canned veggies. How long will they last ? How should they be stored ? Store bought items will always have a "Best By" date, only because they're required to. Any food should be stored in a cool dry place to preserve it's nutritional value. Regular canned goods, IMO should have a shelf life of 2+ years. Obviously, anything that you've had around for a while you'd want to check it for signs of botulism, bulging cans, foul smell, growth. Anything that you're canning yourself in mason jars, not only do you want in a cool dry place, but you also want it out of direct sunlight. That's why I stopped vacuum sealing things like shells, rotini and elbow because the bags have a tendency to crush them, even with the foodsaver on Gentle. Those just get frozen and then stored in buckets. The longer pastas are stored just like in the picture, I carefully put the entire box in a bag, flatten it out across the width of the bag and then seal it up. The pasta comes back out of the bag intact. Been doing it that way for a couple of years now. Do you rotate through your stored food ...and back fill seasonally ? One thing to add, for anyone that's getting started. Store what you'd normally eat on a regular day. There's no point in storing food that you're don't really like to begin with. Dry soup mixes are very good to keep on hand, an easy way to add flavor to rice dishes. (09-08-2012, 02:50 PM)streaker69 Wrote: Yes, I do. Is there a chart for shelf life, or store no longer than?